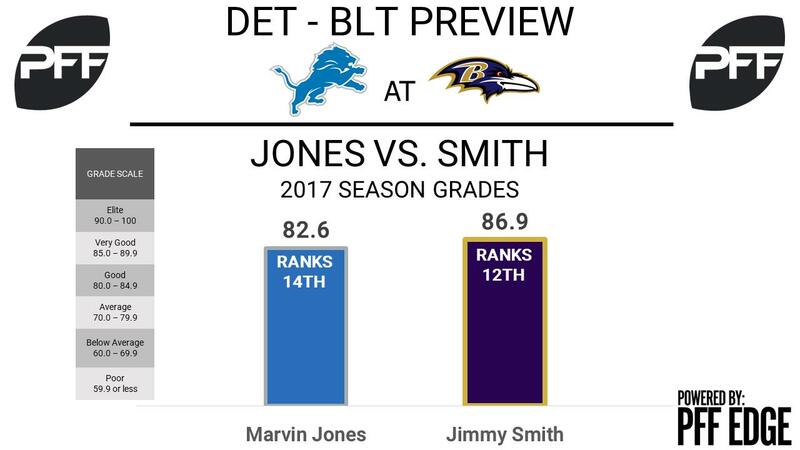 WR Marvin Jones vs. CB Jimmy Smith – Jones enters the game as one of the most productive deep ball receivers on the season. He currently ranks fifth in receptions on deep passes with 10, sixth in yards at 328, second in touchdowns with five. Overall, Jones is having one of his best seasons as a pro ranking 14th among receivers with an overall grade of 82.6. Smith on the other hand is in the midst of a career-year himself and currently ranks 12th among cornerbacks with an overall grade of 86.9. Smith had allowed next to nothing into his coverage heading into the Ravens Week 11 game but gave up 104 yards on four targets to DeAndre Hopkins. Despite the rough outing, Smith has surrendered a passer rating against of just 44.9, the third-lowest mark among cornerbacks. While Jones will be looking for a continuation of his strong season, Smith will be looking to bounce back from a rough outing. WR Golden Tate vs. CB Lardarius Webb – Another premium matchup between a receiver and a cornerback that could decide the fate of the game. This one likely favors Detroit at first glance. Tate brings in the ninth-highest grade among receivers with a mark of 84.5 and has been one of the most productive slot receivers this year. He ranks second in both receptions and yards from the slot with 46 and 533, respectively. Just like most seasons, Tate is a force with the ball in his hands and he has his league leading 19 forced missed tackles to show for it. This week he goes up against slot corner Webb, who has struggled mightily this year. His 44.3 overall grade ranks 101st out of 118 eligible cornerbacks and out of 51 cornerbacks who have spent at least 75 cover snaps in the slot, he gives up the third-most yards per coverage snap at 2.05. Webb has also struggled with missed tackles this season, ranking 99th in tackling efficiency, which could be a problem going against Tate. T Taylor Decker vs. Edge Terrell Suggs – The Lions eagerly awaited the return of promising young tackle Taylor Decker who made his way back from injury Week 10. Unfortunately, Decker hasn’t played any where near his 2016 form. Through three games he has earned an overall grade of just 47.5. He has surrendered eight total pressures on just 103 pass-block snaps and will need to tighten up his game if he plans to slow down Suggs, who brings in a top-20 overall grade among edge defenders with a mark of 84.8. Suggs is still one of the most productive 3-4 outside linebackers rushing the passer and has produced 43 pressures, including a combined 17 hits and sacks. WR Mike Wallace vs. CB Darius Slay – Slay has had a great year so far, earning a grade of 88.8 and ranking eighth among cornerbacks. He has allowed a passer rating when targeted of just 65.7 and is tied for most interceptions by a cornerback with four. 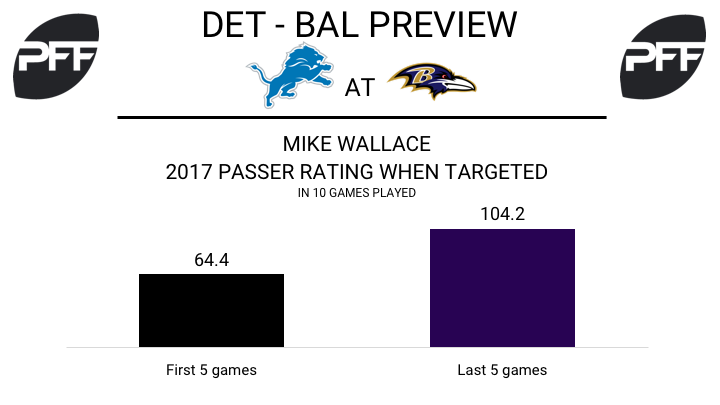 Wallace has had a very solid past two games, with nine catches for 104 yards and a touchdown over that span, and a 110.4 passer rating when targeted. His overall grade of 69.9 is just outside the top-60 receivers, but another good game should give him the bump he needs into 70.0-plus territory. RB Alex Collins vs. LB Tahir Whitehead – Whitehead’s run-defense grade of 85.5 ranks 13th among linebackers, so this week may not be such an easy matchup for Collins. Among all 4-3 outside linebackers, Whitehead has the third-most run stops with 25. Collins’ run grade of 81.0 ranks 10th among running backs, and he’s seen 36 carries over the last two games. He is also tied for the second-most runs of 15-plus yards with 11. T Ronnie Stanley vs. Edge Ezekiel Ansah – Ansah is coming off his second best pass-rushing performance of the season, recording four total pressures including a sack against the very difficult to sack Minnesota Vikings. Stanley hasn’t graded above average since Week 6, and has allowed 10 pressures over his last four games. Ansah is a manageable matchup for Stanley this week, but he has shown to be inconsistent in pass-blocking this season.